Aktau is a small mountain massif located in the Eastern part of Altyn Emel National Park, in Almaty region. There are 300km to the Northeast from Almaty (5 hours). There are 2 main ways: by A353 highway via Kapshagay to Bash’shi village (292km) where the entrance to the Park is situated. Or by A351 “Kuldzha road” via Shelek town (380km). You need to stop at Bas’shi to get the permission, and then follow the ground road further to the Southeast, in a direction of Ili River. There is no regular bus connection. It is a desert: the best seasons to visit are March-May and September - October. 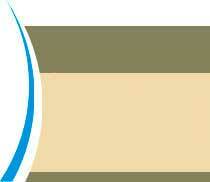 In Spring and Autumn the normal day temperatures are +23..25C, night +5..+15. In Summer period it can be really hot (uncomfortable): up to +40C during a day, +10..+20 in the night. Aktau is a small mountain massif located in the Eastern part of Altyn Emel National Park. Its origin is connected with the rising of land area that is a long time ago-back in the Cretaceous period was the bottom of the ancient Tethys Ocean. Before lifting and draining of land, sea currents, connecting and intertwining with each other, lowered portable terrestrial rocks of different composition and density to the bottom. Over millions of years after the retreat of the ocean, the water and wind have washed and weathered weak rock, erecting of the remaining species whimsical shapes and compositions. The whole landscape of Aktau mountains is so unusual and fantastic, that it feels like another planet. It is impossible to descried the beauty: it is definitely should be visited! 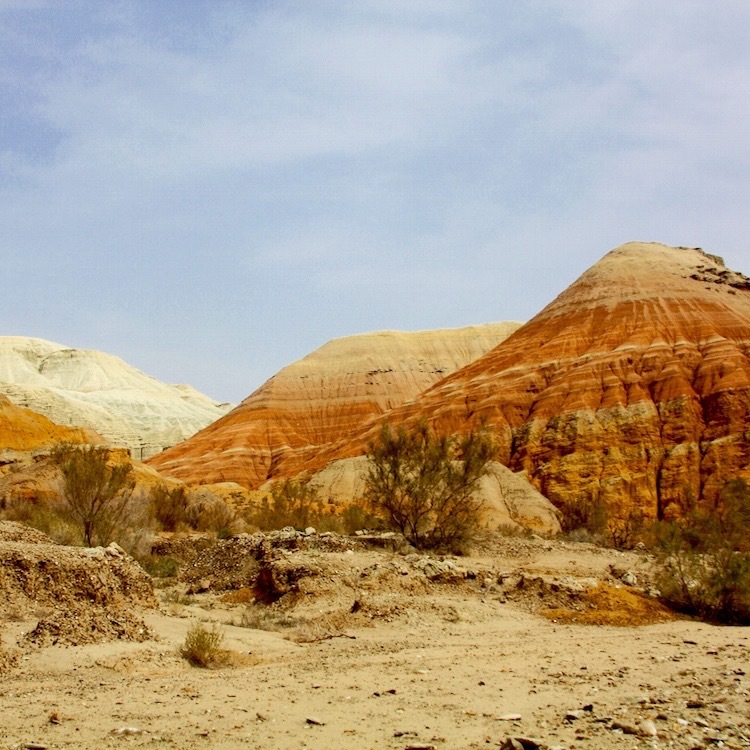 Ancient Aktau Mountains poses peculiar beauty, slopes and canyons of unimaginable colors and shades from brick-red to a dazzling yellow. 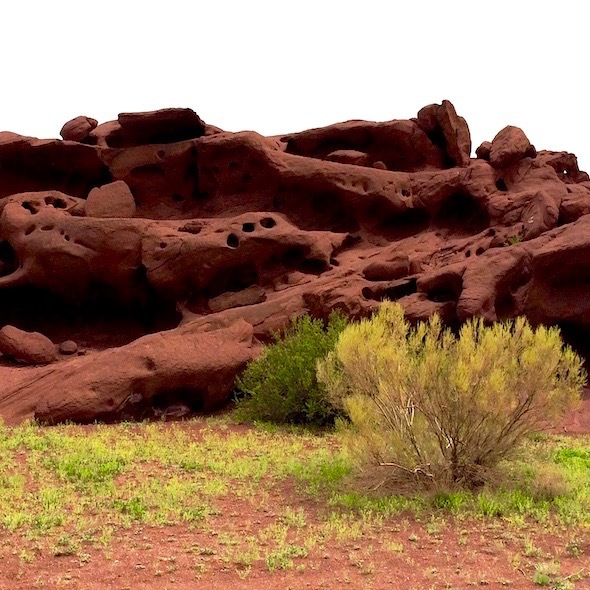 Despite its lifeless look, Aktau is full of life forms: such plants like remarkable desert shrub Calligonum, amazing "cones" of Cistanche, black haloxylon, turanga and relict argan trees (Caucasian hackberry) are wisely found here. 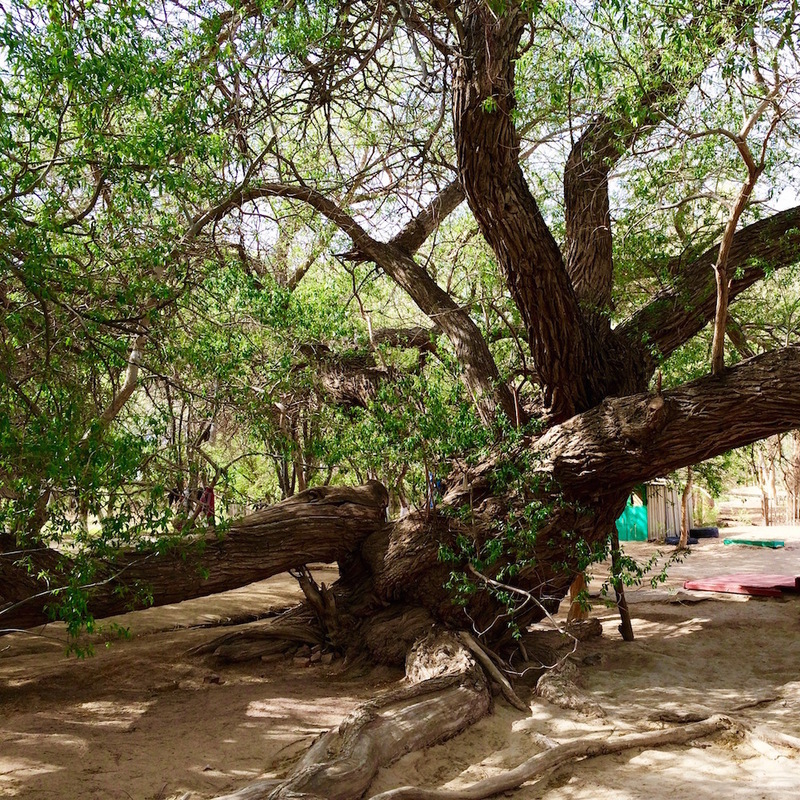 A big 700 years old willow tree still wait for the tired travellers near the spring. 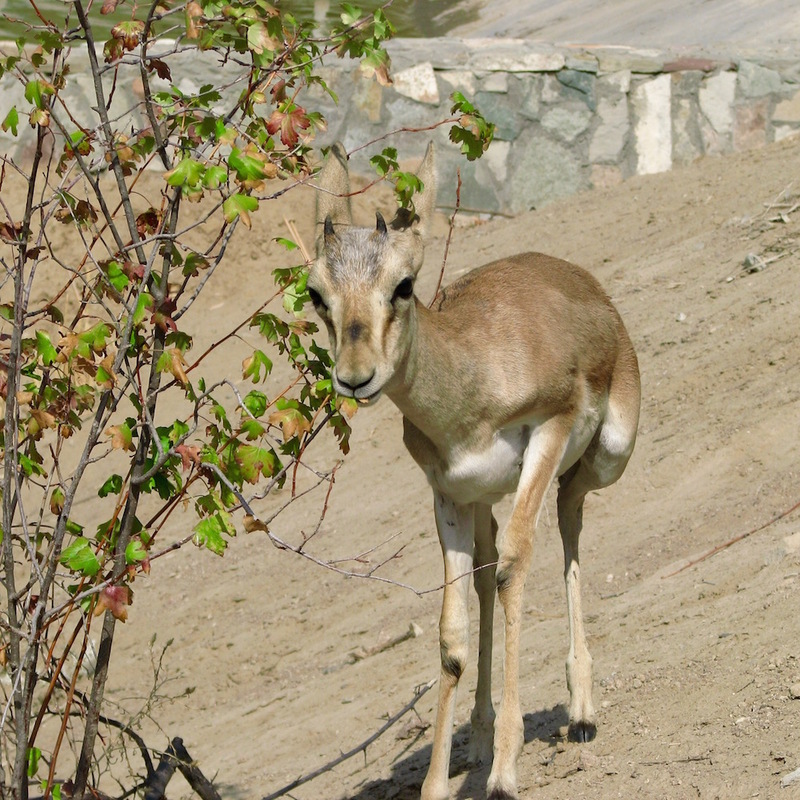 Brisk steppe agamas and jerboas appear in the evening, and there are still large flocks of "dzheiran" gazelles and kulans graze in the valley. Mountains are nested by golden eagles, serpent eagles, bearded vultures, saker falcons, etc. The desert is inhabited by black-bellied sandgrouse, Pallas sandgrouse and ruffed bustard. The swamps are inhabited by herons, ducks, sandpipers and other birds. The Katutau Mountains are just as attractive and unique as shrine. Time, water and the sun have created intricate rock rarities here. 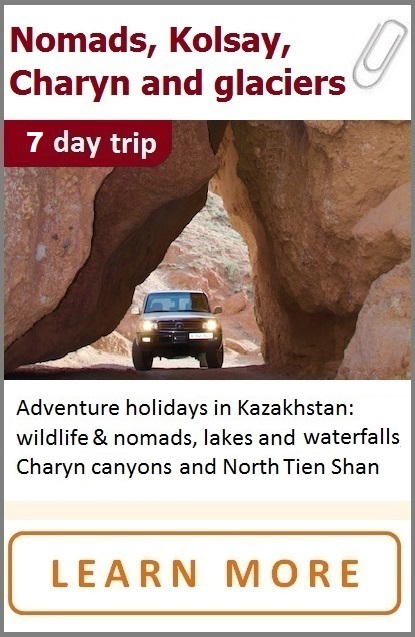 As you pass wild and uninhabited gorges, you can see a mother bear bending over a bear-cub, or a huge upturned boat of Robinson Crusoe, with the dead Aktau Mountains nearby. The word Katutau translates as "harsh mountains" from Kazak. This is a very old badly eroded mountain exits of volcanic rocks. Volcanic rock is very brittle and easily shatters by physical impact. Water, time and wind carved in the rock bizarre shape. 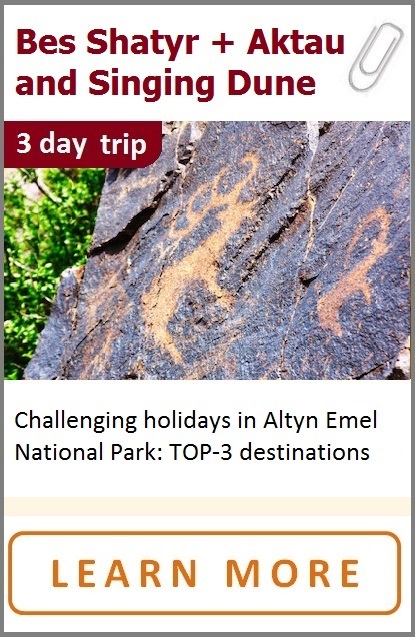 Note on Altyn Emel National Park: it was established in 1996 by a decree of the Kazakhstani government to preserve a unique natural complex on the right bank of the Ili River and rare species of animals and plants. The total area of the park is about 520,000 hectares, which makes it the biggest park in Kazakhstan. 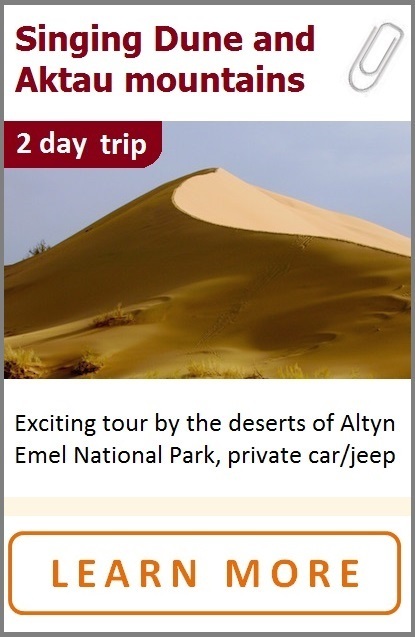 Its area consists of Western branches of the Dzhungarskiy Alatau, desert mountains of Katutau, Aktau, Ulken and Kishi Kalkany, and a unique natural monument, the “Singing Sand Dune”. The park is a unique combination of various natural landscapes like deserts, mountains and rivers, which results in versatile vegetation and wildlife. 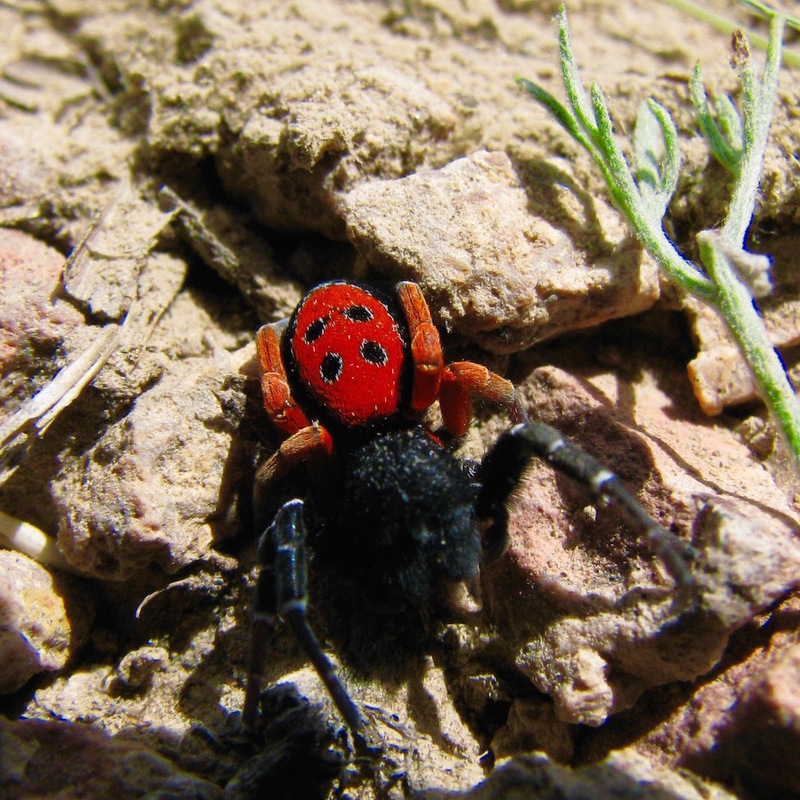 Flora and fauna of the Altyn Emel Park is very rich and diverse about 200 species of plants, 78 species of animals, 230 species of birds, 12 reptiles, 4 species of amphibians, more than 30 species of fish, more than 10.000 species of insects and other invertebrates. Some species of plants and animals are endemic, can only be found here, many of them are registered in the IUCN Red List of the Threatened Species.